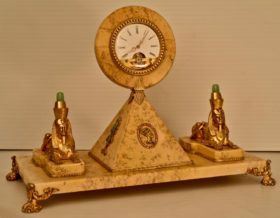 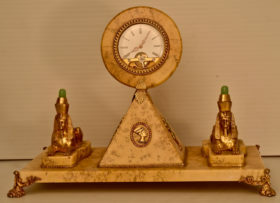 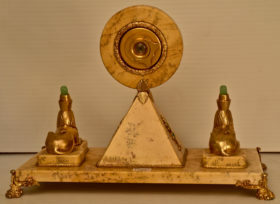 This is a very unique hand made desk clock in pale yellow stone depicting a central pyramid flanked by a sphinx on either side, set atop raised platforms. The pyramid is topped by a circular clock set within a beaded case. 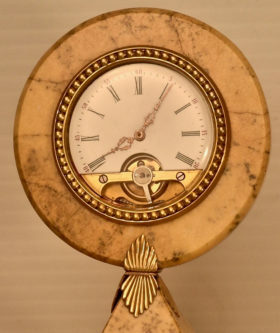 The clock houses an 8 day movement by Hebdomas, and the face features a skeletonized escapement with delicately ornate hands. 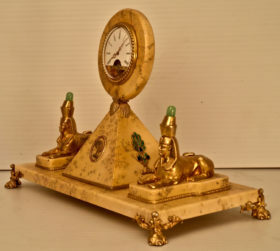 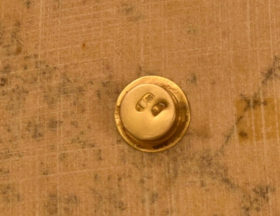 Ormolu Egyptian revival motifs are featured on 3 sides of the pyramid and the base is mounted on ormolu feet. 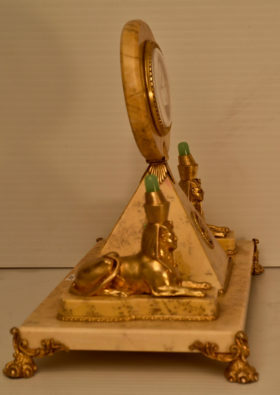 To add further interest, the sphinxes are topped by raised headdresses with green stones set within.